Public speaking is par for the course as you operate in the professional world. In order to gain credibility, prominence or legitimacy, at some point you will have to face the fear of doing so. The whole point of speaking in front of a group is to persuade them to listen and believe what you have to say: to get a point across effectively and articulately. The most common way of getting around public speaking is by generally ignoring it, perhaps shying away from opportunities to present, until the moment you absolutely have to get up and speak, and then freaking out. Instead, here are some tips I use for public speaking to make it less nerve-racking and more effective. 1. Face the music: whether you like it or not, you’re going to have to give a presentation publicly. The earlier you recognize this and come to terms with it, the easier it’s going to be. 2. Find opportunities to practice public speaking that are lower-impact. Participate in larger meetings. Ask questions in public fora (you know me!). Get your voice out on a larger scale that doesn’t involve a soliloquy to warm yourself up. 3. 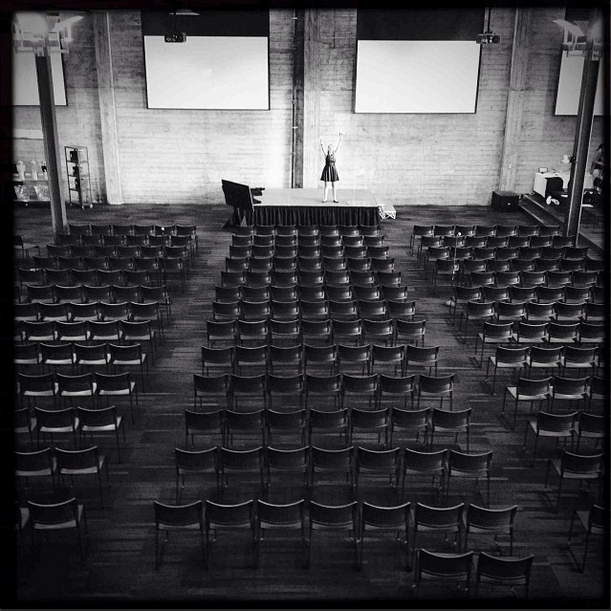 Practice, Practice, Practice: there is no such thing as being over-prepared for a public speaking event. Winging it simply isn’t an option, and people will sense that you are floundering, which will cause a perpetual cycle of insecurity. Begin practicing 2 nights before the event. Write it out. Read it through. Say it in the mirror, recite it in the shower, and try to get yourself an audience of 1-2 to listen to you. Force yourself to say the whole thing through. Whether it’s a presentation or a speech, making sure you are comfortable with an entire run-through is critical. There are often talking points at the end that never get practiced, and can be taxing at the end of the speech to land a clean ending without. 4. Speak slowly and decisively. This is something I have a lot of trouble with since I’m a fast talking New Yorker. But when you get up on stage, other people are hanging on every word you say. Speak slowly so that they can comprehend. Pause appropriately for effect. And be decisive in your word delivery so that the audience is convinced of your word choices. 5. Recite, but don’t memorize. You’ll psych yourself out if you try to memorize a whole monologue. It’s easier if you have slides in the presentation to serve as mile-markers, but in general memorization usually causes downstream effects during the time of your presentation. Often times when you memorize something and you forget to say a line, you lose your place and are unable to continue. Instead what I do is structure it in terms of thought progression and let the words say themselves. Plus, when I am practicing, I find that I repeat the same phrases when expressing a sentiment enough times that I am comfortable with a few different ways of saying what I mean. That way, I ensure that it will come out effectively during the actual presentation. 6. Talk to the forehead. I was once given the advice that speaking to people’s foreheads in the audience is an effective way to deliver eye contact. You are still looking at your audience members without getting locked into anyone’s gaze, which itself can be distracting. In addition, scan the audience by directing your attention to one area of the room during one thought, and then moving the focus to a different area at the next. 7. Take up space. Women especially are less inclined to do this, but taking up space lowers your anxiety and exudes a sense of confidence, even if it’s not really there. Open your legs and broaden your shoulders (especially you, ladies!) It’ll make you feel relaxed, and if anything it’ll fool your audience into thinking you know what you’re saying. 8. Don’t fiddle with the clicker, your hands, etc. Nervousness tends to manifest itself in habits like playing around with a slide changer, waving your hands or placing them in your pockets. This can only be distracting to your audience and demonstrates weakness and insecurity. Most importantly, never touch yourself (head on forehead, hand on elbow, etc). It’s considered to be rude but also shows nervousness. 9. Engage (with) the audience. Where possible, try to ask questions or elicit some type of response from the audience. The more candid you can make your speech sound, the more you will naturally pause for breaks for things like laughter or emotion. And don’t forget, just because you’ve practiced a line until the joke becomes tired, doesn’t mean that your audience has already heard it. They’ll probably still be inclined to laugh – at least, a little. 10. Breathe. Take pauses between thoughts and deep breaths between sentences. Give the audience time to catch up with you. It will feel unnerving and unnatural, but in hindsight, it’s always for the best. I can feel my soul separating from my body. Wanna share this Engage – What NOT To Do When Presenting . Verity can help you be a great public speaker!